Michael Harris, director of the group's Wildlife Law Program in Colorado, said the roundups could occur without public notice or comment and without site-specific analysis of each individual gather. 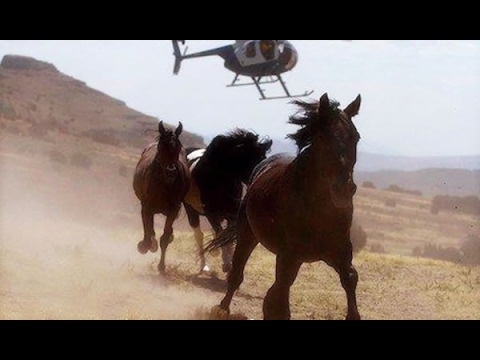 The "roundup decision is unprecedented in size and scope," the suit states, and would allow BLM to "continually roundup, remove, drug and castrate wild horses for 10 years after the initial roundup." Friends of Animals President Priscilla Feral told the AP that castration puts male horses at risk of hemorrhaging and infection, and those that survive the process "will be robbed of their natural behaviors, putting them at a disadvantage on the range in terms of survival." "This is the definition of animal cruelty," Feral added. "These are wild animals, not domesticated dogs and cats." BLM District Manager Jill Silvey authorized the gathers in December. "Native vegetative communities in parts of the complexes have already crossed critical ecological thresholds that could prevent or significantly slow their recovery," she said at the time. "This resource degradation and potential for irreversible ecological damage will continue without immediate action to remove excess wild horses and to bring the wild horse population back to (appropriate management levels.)" But the group contends that the roundups are based on outdated population targets adopted in management plans that have not been updated for more than a decade.